Yesterday I talked about the star T Tauri, a red star that is transitioning into a main sequence star. The image yesterday was a composite of visible and near infrared images. The image below is a high resolution image at an infrared wavelength known as the K-band. 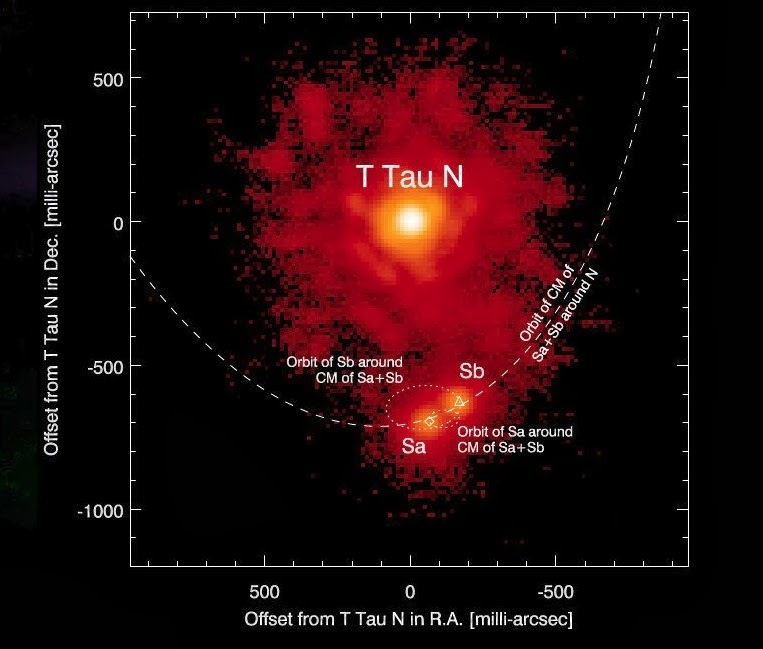 You can see the visible star labeled as T Tau N (T Tauri North). You can also see two smaller stars, labeled Sa and Sb. 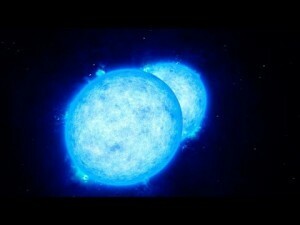 These two stars don’t emit much light in the visible, so they can only be observed in the infrared. Earlier images didn’t resolve the binary pair, and instead only saw it as a single star (T Tauri South). It has only been in the past few years that we’ve seen them as a binary. In the image, it looks like N is much larger than Sa/Sb, but looks can be deceiving. The apparent size of an object is a function of how much light it gives off at the wavelength being viewed. It is not a measure of its size or mass. With main sequence stars we can estimate their mass by their temperature (or color). 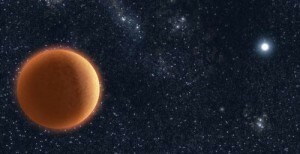 This is because the temperature of a main sequence star is related to its mass. But for T Tauri stars this is more difficult to do because they are not entirely stable. They also reside in an area of gas and dust, and this can block some of the light, particularly in the visible spectrum. So estimating the mass of a T Tauri star is a bit iffy. Now that we know these are a system, determining the mass is a bit easier. That’s because we can measure the orbits of the stars around each other. The rate of their orbits is dependent on their masses, following Kepler’s laws. Since Sa and Sb are in a closer orbit, it is easiest to determine their masses. What we find is that Sa is a bit more than 2 solar masses, and Sb is about 0.8 solar masses. Determining the mass of T Tauri N is a bit more tricky, because the orbit of Sa/b about N is more uncertain. The best estimates put the entire mass of the stars somewhere between 4 to 6 solar masses. Since the total mass of Sa and Sb is about 3 solar masses, that would put N at around 1 to 3 solar masses. The best fit to the observations we have so far put T Tauri N at about 2 solar masses, just a bit smaller than Sa. With further observations we should be able to pin down the masses of these stars. We should also be able to resolve a small puzzle. It seems that Sb has recently undergone a shift in its motion. It’s possible that due to its interaction with Sa and N it has been ejected from the system, and will soon be leaving the other two. The latest measurements indicate that it is likely still bound to Sa, but we can’t yet rule that the star is being ejected. It is possible that T Tauri is in the process of becoming a binary rather than a trinary system. But for now, three is the magic number.